Coloring Princess Mirah Batiks is a patient process. It begins with the first color bath applying the dominant color. Then, having been washed, the textiles are folded onto screens in open air providing abundant sunlight. Strings of color are then applied to make the characteristic blends that Princess Mirah is so famous for. Knowing how to fold the fabrics and apply the color requires both experience and method. The workers are from generations of batik workers, where the experience of coloring and stamping runs from father to son for generations. Soda is applied to preserve/enhance color, and bathing in the tropical sunlight makes the colors both deep and vibrant. Timing is of the essence. The fabrics need to bathe in the sun to get the right tan of color, neither staying too long nor too short in the sun to get exactly the color Princess Mirah is looking for. To become a master of batik stamping requires meticulous precision and care. Seeing the master at work is like watching a dance. The copper stamp with the handle is first dipped with great care in hot wax before the master with ease and speed moves the batik stamp to its designated place on the cloth, measured out, in advance by the craftsman's left hand, which directs the stamps and balances his own weight while he lightly makes the impression into the cloth, before the process is repeated all over again. All the copper stamps are hand made by these masters based on original drawings by Princess Mirah. 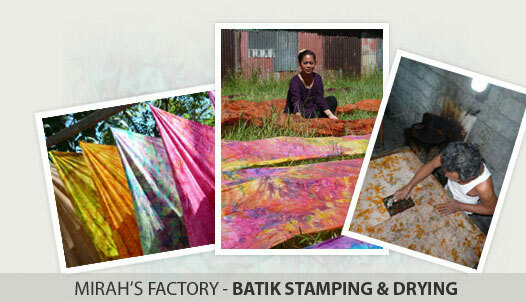 Princess Mirah has been producing the finest batiks in Bali since 1981. Production is a complicated process that ends with quality to control, double folding, labeling and packing, to ensure that the batiks that reaches you holds the highest standards. 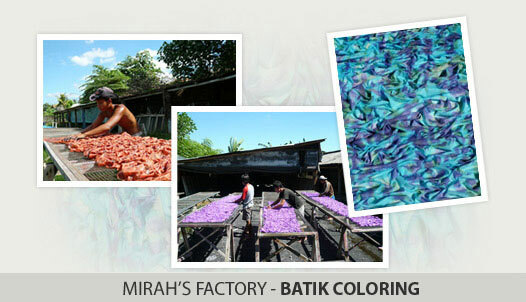 Here is a glimpse of some of the people and staff that brings Batik by Mirah all the way from Bali to you.